Studying with Tomaž Šalamun while he was a visiting professor at the University of Pittsburgh from 2005-2007 was one of the highlights of my life. I took four classes with him, he was on my MFA thesis committee, and when he left Pittsburgh, for what I believe was the last time, I drove him to the airport in what he called my “tank.” He was a remarkable human being. Generous, expansive, kind, and dynamic, Šalamun profoundly impacted everyone with whom he came in contact. On first reading his poems, they leapt at me, and have continued flying around my head for years. In my favorite of his books, Balada za Metko Krašovec (1981), he declares: “I am the mouth of the Book.” He ate voraciously of the world, of books, and sometimes spoke and wrote like the wellspring of literature itself. He was a powerful poet who invited everyone to soar with him: “I like being in the air. I descend on the city, on / people.” I am thrilled to be one of the people he descended upon. Looking through my notebooks from the three consecutive spring semesters I studied with him (in 2006, two workshops at once), the vast majority of what I wrote down during class were the names and works of poets, artists, musicians, novelists, philosophers. 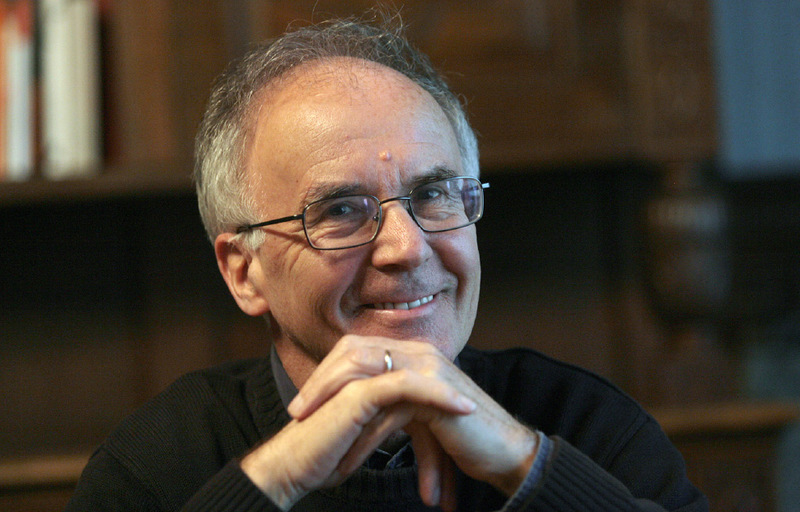 Tomaž had an immense capacity for awe and appreciation, and he readily shared it with everyone around him. He read and absorbed culture to a remarkable degree, letting everything flicker through his being: from the work of his young students—he adored the work of Joshua Beckman and Matthew Zapruder, among many others—to his peers, modernist painters, and filmmakers—he argued vehemently that Pier Paolo Pasolini was a poet—and so much more. Every semester he would order roughly eight books from the bookstore, but he would not usually assign them or schedule days for us to discuss them. Instead, he would hand out what he was reading that week, what he was excited about. As a result, not only did my library of books and files of photocopied poems and essays grow considerably, but I perhaps caught some of Šalamun’s own catholicity and voracity, his passion for the contemporary, and his faith in poetry. It was hard not to. Returning to my (seemingly) ancient notebooks this morning, I was initially struck by how little I wrote down of what Šalamun said in class. But then I remembered why. His voice was music. It didn’t always make sense and my pen could not keep up, but it was such a joy to hear him speak while occasionally capturing the gems of books he was reading or his reflections on the books his students were reading. I would spend much of class sunk in nothing but his voice. He would read poems in a way that transformed how I teach creative writing workshops. He would explore every nook and cranny of where a poem took his enthusiastic and often confounding readings, no matter who wrote it, and then he would go somewhere else. He would get up and spread imaginary wings or become, however briefly, a real dinosaur. How could I capture such performances in notes? What would be the point? I did not even try. But I hope his voice still resonates in Cathedral of Learning 512 and I know it will continue to do so with the many people who received the gift of being in that room. Šalamun was above all a poet. Everything about him resonated with poetry. He would often end class early to have one-on-one conferences with students. Suffering from the normal “crisis of artistic faith during the first year of grad school”-syndrome, my first meeting with him, quite simply, totally renewed my ambitions and convinced me that poetry was something I should pursue. True or not, I return frequently to what he told me. He had that kind of power, that kind of poetic power: he could transform or refresh almost instantly. And he did so because he was a poet in the strongest sense of the word. For one of the very few things he said that I did write down was: “The poet has to be totally a poet! We don’t need mediocre poets.” Tomaž Šalamun was totally a poet. He encouraged those around him to be total poets as well. (Whether any of us became such mythical beings or not is probably beside the point.) In an age when poetry seems low on the list of anyone’s priorities, even those of us who read, write, and teach poetry, when an MFA classroom can often resemble a seminar on professionalism and/or mediocrity, Šalamun subtly, warmly, and convincingly required the same total devotion to poetry of his students that was on display in his own work throughout his career. And once that easily fulfilled requirement was out of the way, we all then flew and will keep descending on the cities and the people with him. Tomaž Šalamun, Balada za Metko Krašovec (Ljubljana: Državna založba Slofenije, 1981). Tomaž Šalamun, “‘Within the mountain . . . ,’” in A Ballad for Metka Krašovec, trans. Michael Biggins (Prague, Czechoslovakia: Twisted Spoon Press, 2001), 49. I sadly have no capacity for Slovenian so will rely on English translations. That said, Šalamun was extensively involved in many of his English translations, and not everyone translating him knew Slovenian, so the English translations have their own particular authority and power. If this sounds hyperbolic, I invite the reader to relish in such hyperbole, as Šalamun would have certainly encouraged them to do so with his own remarkable, Whitmanian verbal hyperbole, for “Tomaž Šalamun is naked and a proletarian”(“His Favorite Ride,” in The Book for My Brother [New York: Harcourt, 2006], 13), “Tomaž Šalamun is a monster. / Tomaž Šalamun is a sphere rushing through the air” (“History,” trans. Bob Perelman and Šalamun, in The Four Questions of Melancholy: New and Selected Poems, ed. Christopher Merrill [1988; repr., Buffalo, NY: White Pine, 2002], 77). Šalamun, “West Broadway,” in A Ballad for Metka Krašovec, 43.